HERE’S a hint for plumbers, or, for that matter, for anyone who is handy with a paint brush. 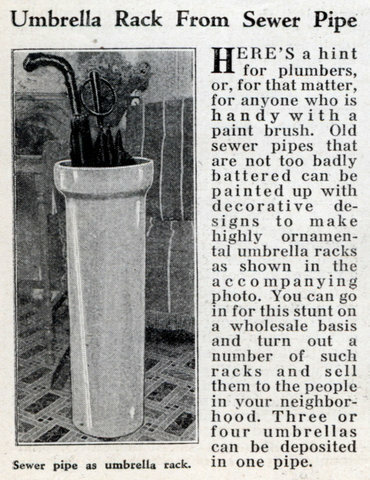 Old sewer pipes that are not too badly battered can be painted up with decorative designs to make highly ornamental umbrella racks as shown in the accompanying photo. You can go in for this stunt on a wholesale basis and turn out a number of such racks and sell them to the people in your neighborhood. Three or four umbrellas can be deposited in one pipe.